As you may know by now, it's super hard for me to resist a challenge! I learned of the My Stash, My Style challenge through Instagram. 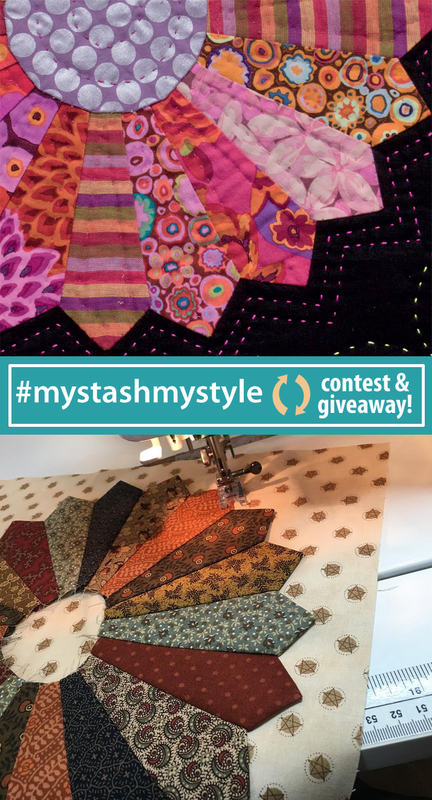 Jenifer Gaston, author of "Primitive Style," and Tonya Alexander, author of "Stash Lab," (along with the publisher, Martingale) teamed up to challenge readers (and themselves!) 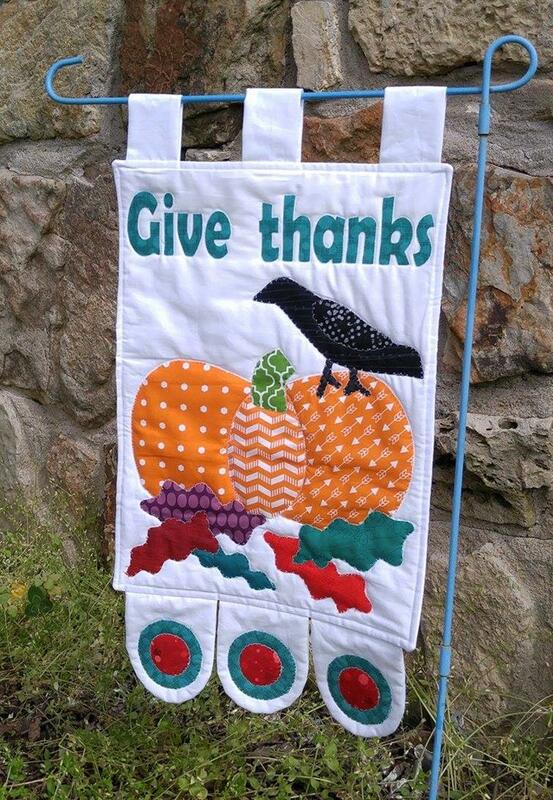 to create projects from the book that is furthest from their normal style. 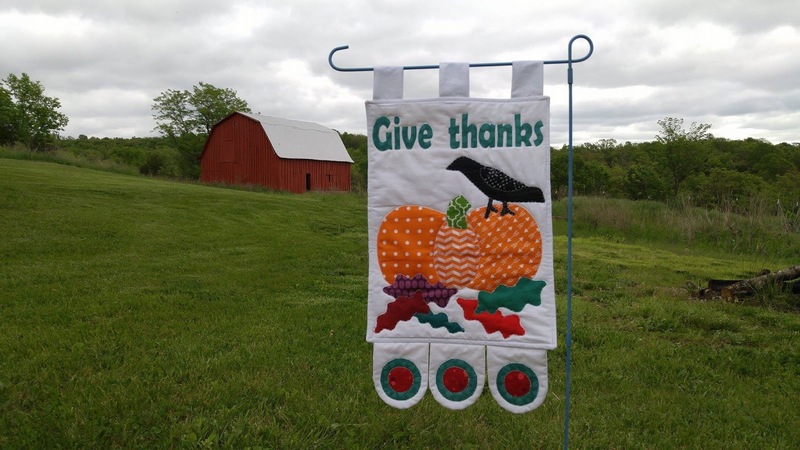 Jenifer's style is mostly folk art, and she uses wool and traditional fabrics. Tonya's style is more modern, and she uses bright and colorful fabrics in her projects. The premise of the contest was to choose a project from one of the books, then reimagine, redefine, and remake that project in your own style, using your stash, your point of view, and your creativity. I tend to use more modern fabrics, so I knew I needed to pick a project from Jenifer's book! This was the most challenging part for me! Her style is so far from my own, that it was hard to look at the pictures and imagine any of them in different fabrics! 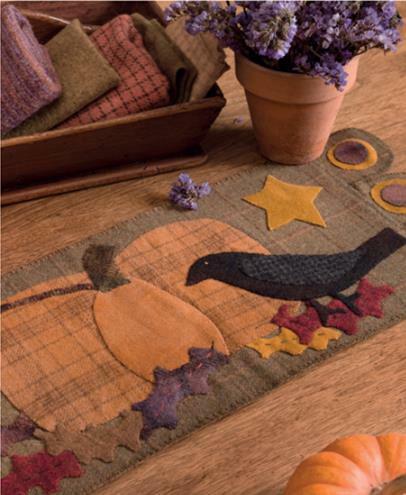 I finally picked a pumpkin table runner that was made from wool. I have been wanting to make a fall garden flag, so decided this was a great opportunity to try it! 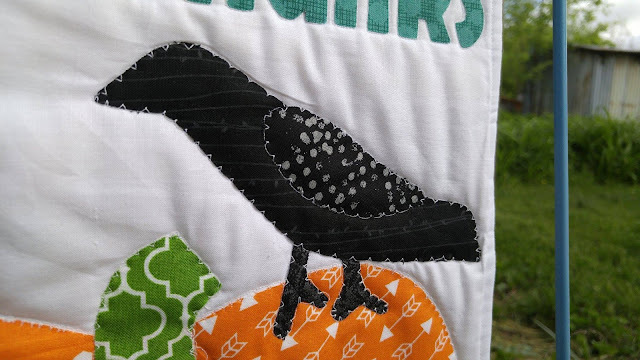 I thought I could use raw edge applique and some fusible interfacing to recreate it in my own style. Copyright 2015 Martingale. From "Primitive Style" by Jenifer Gaston. The original project had a horizontal orientation, but I had to turn it vertically for the garden flag. This meant resizing the pieces and changing the layout in order to fit it on the size I needed. I waited until the day before the deadline to get started (I've always been a procrastinator!). 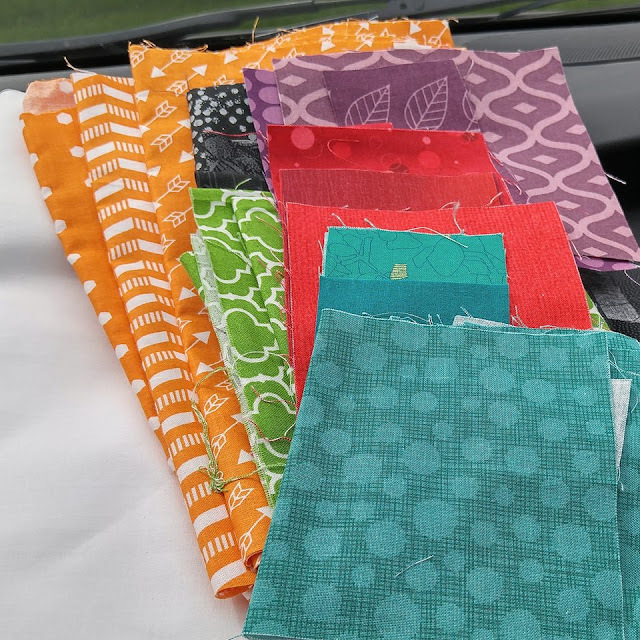 We were traveling, so I cut all the fabrics and hand sewed what I could while riding in the car. Once home, I started by remaking the tabs on the ends of the table runner for the bottom of my flag. I cut two pieces of white fabric in the same shape as the original, but then sewed them wrong sides together with a piece of batting. Then I turned them right sides out and pressed. 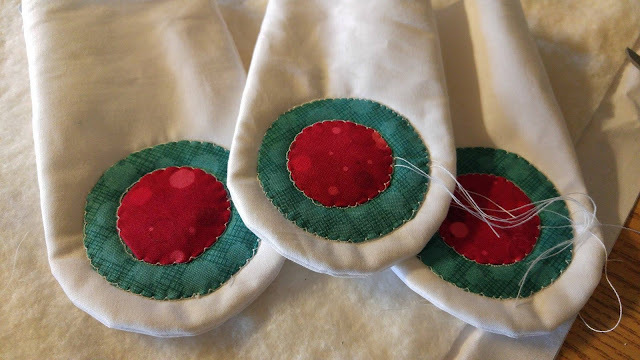 I hand sewed the circles similar to how you would make a fabric yo-yo, then used my sewing machine with an applique stitch (is that what ----^ is called??) to sew them to the tabs. 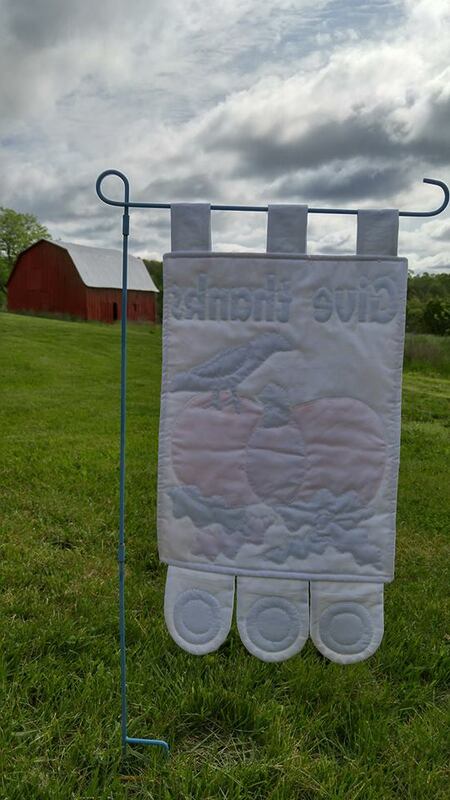 This also quilted the tabs at the same time! I made three fabric tubes to use as hanging tabs for the top. I laid the pieces onto my main garden flag pieces and stitched around all four sides, leaving an opening a few inches wide. I turned the entire flag right sides out and stitched around the outside edge again to close the gap. 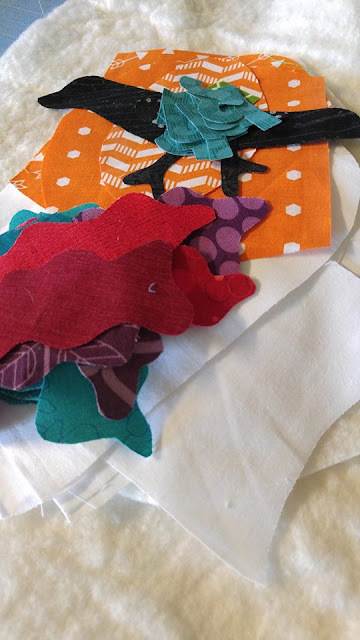 Next, I used the same ----^ (applique?) 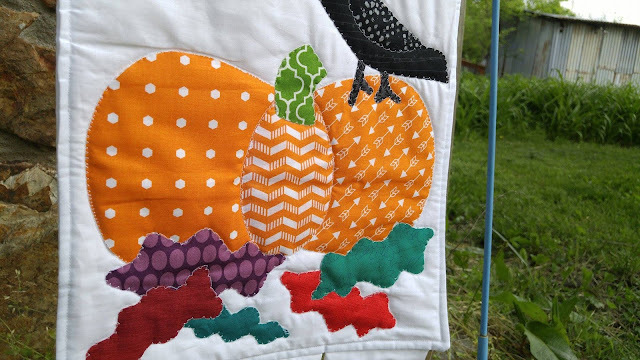 stitch to sew the pumpkin, leaves, and bird onto the flag. These pieces are not fused down, and I just left the raw edges. Again, it was quilted as I sewed the pieces down! I had made the letters by fusing Heat-N-Bond to the back of the fabric before cutting them out. 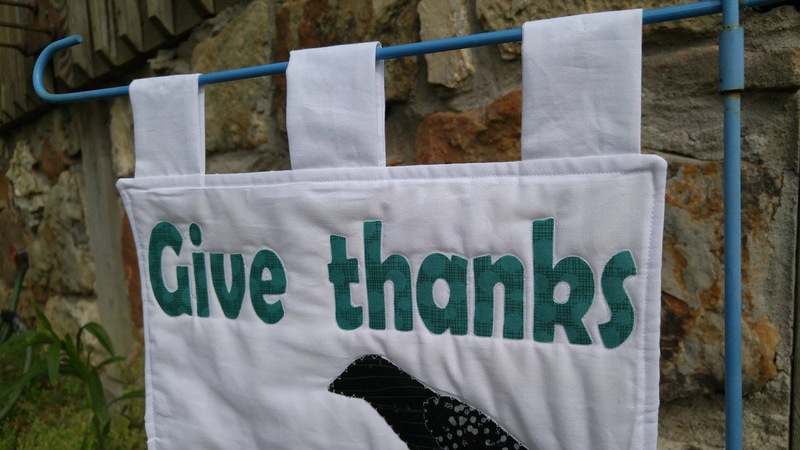 So I ironed them onto the flag, then quilted around each letter instead of appliqueing them on. I finished the project with two hours to spare (in my time zone!)! 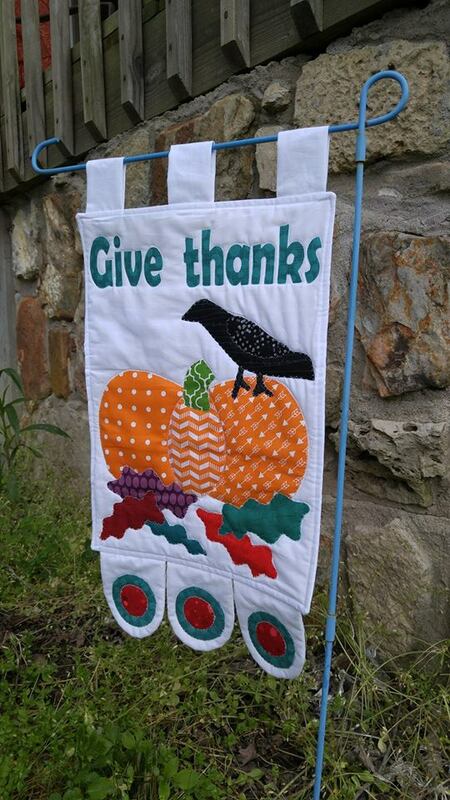 I really enjoyed this challenge, as I find it hard to imagine a project in different fabrics than the original! It is bright and cheery, and not typical fall colors! 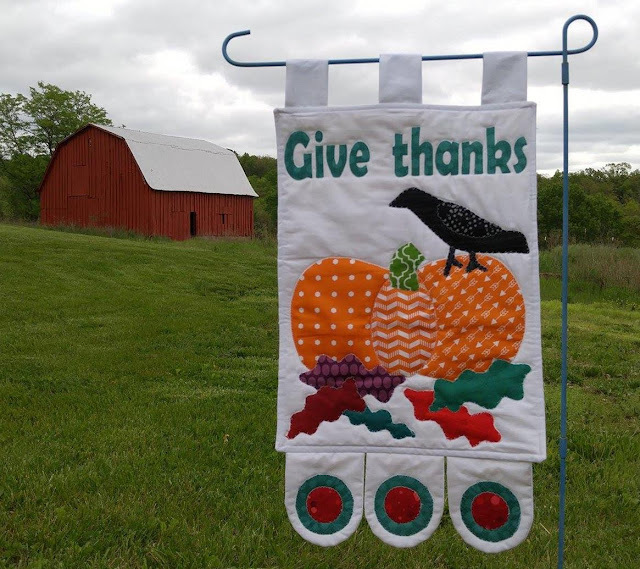 The winner of the challenge is going to get a subscription to "Primitive Quilts and Projects" magazine, some colorful fabrics from Tonya, some wool from Jenifer, and a $50 gift certificate from the publisher Martingale! The contest deadline has been extended, but I'll update this post to let you know if I win! 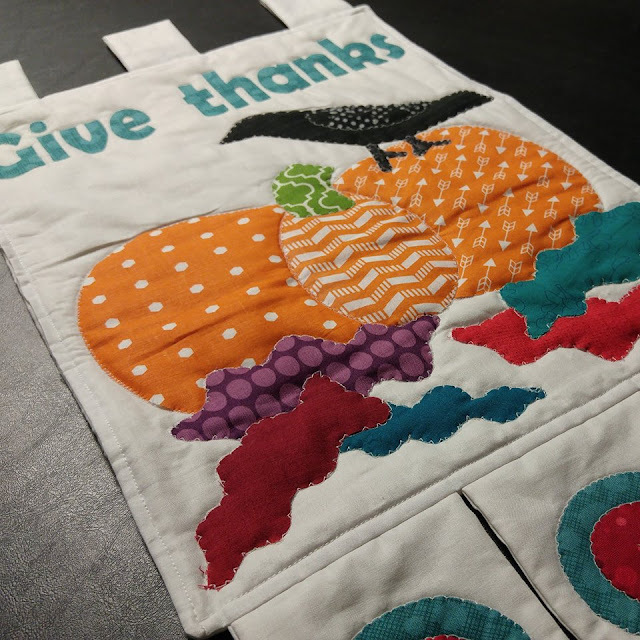 Beautiful project Laura and a great blog post sharing it! Thank you so much for taking the challenge! And good luck in the prize drawing - although I think you have the best prize already! Thank you! I loved the whole concept behind the challenge! That's the hardest part for me when looking at a pattern - choosing the fabric!